You don't need a sewing machine to create a gorgeous quilt. In fact, some people prefer hand quilting for the way it allows them to create a quilt that is truly unique and hand-crafted. Making the quilt by hand will give it a softer feel as well. You'll find the things you need to start quilting by hand are affordable and easy to purchase. You can make your project go more smoothly by getting the correct supplies for the job. In addition to the basic sewing tools of scissors, an iron, and a thimble, if desired, gather the following. When you quilt by hand, it's important to use a short needle with a smaller-sized eye. This type of needle is called a "between," and it allows you to move deftly through multiple layers of fabric. A longer needle can get in the way because it is more difficult to maneuver. 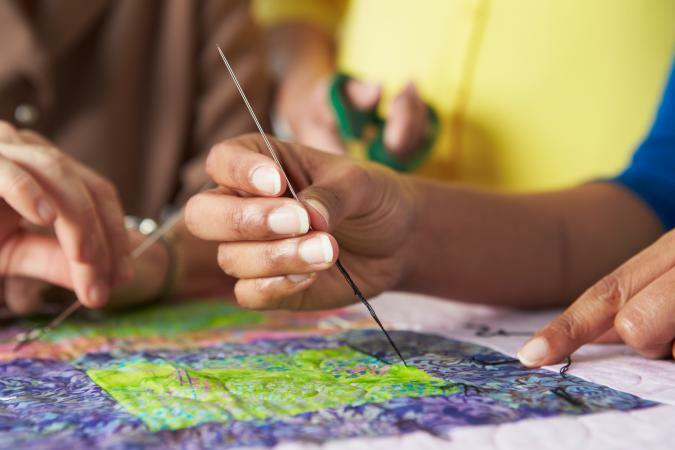 Quilters have varying preferences when it comes to needle size, but you'll generally do well with an 8, 9, or 10. Have several needles on hand in case you lose one. Unless you are doing a very small hand quilting project, like a placemat or pot holder, you'll want to have a frame or hoop to hold all the layers of fabric for you. For very large projects, such as a bed-sized quilt, choose a floor frame. Generally made of wood or plastic, these set up in front of your chair and hold the quilt for you. They start around $20, but it's wise to invest in a good quality one with positive consumer reviews, such as the Q-Snap Floor Frame. It retails for just under $130 at JoAnn, but it often goes on sale. For smaller projects or if you want the flexibility of quilting in different places and positions, a hoop is a great alternative. They come in different sizes and are usually made of wood or plastic. The Dritz 10-Inch Quilting No-Slip Hoop is a good choice with overwhelmingly positive consumer reviews. It retails for about $17 on Amazon. Always choose a cotton thread for quilting. Quilters have varying opinions about the best brand, but any high quality thread will work. Select a color that matches the background or the backing of your quilt. You can use straight pins for your quilt, but bent safety pins are another great option. They stay put and don't poke you as you maneuver the layers. A pack of 50 pins cost about $4. Once you've assembled your supplies, it's time to get started. 1. Assemble and Baste the "Quilt Sandwich." To start quilting, you need to make what is called a "quilt sandwich" and then baste these layers together to hold them as you work. The process can be a bit time consuming, but it will be immensely helpful as you're working. Press your pieced quilt top so all the seams are open and flat. Lay it face down on a large, clean surface. If possible, tape the edges of the quilt top to the surface to keep it from moving. Spread the batting on top of the face-down quilt top. Make sure it is even and has no wrinkles or bumps. Press the quilt back and spread this face-up over the batting. You should now have three layers. Starting in the center of the quilt and moving toward you, begin pinning through all three layers. Keep everything smooth and wrinkle-free as you work. If you plan to use the pins to hold the layers together as you work, called "pin basting," place the pins no more than four inches apart. If you prefer not to pin baste, take large stitches through the quilt sandwich, making sure the lines of stitches are no more than four inches apart. You can then remove the pins. When you reach the edge, trim the backing and batting so they extend no more than an inch or two past the quilt top. 2. Put the Quilt in the Frame or Hoop. If you're using a frame or hoop, it's now time to put the quilt in it. Start in the center of the quilt and after you've finished quilting that section, move out toward the edges. This helps keep the layers aligned. Do not pull the quilt too tightly as you apply the frame or hoop. This will cause the fabric to stretch and pull out of shape, and you need a bit of looseness to work properly. 3. Thread the Needle and Begin. Generally, you'll want to start with about 18 inches of thread on the needle. It's tempting to make the thread longer, but tangled thread will slow you down later. After threading the needle, make a small knot in the end of the thread. Trim the end. Use the needle to stitch down through the quilt top and batting but not into the backing. Pull the needle back up through these two layers. Give the thread a sharp tug to pull the knot down through the quilt top and bury it between the layers. To quilt, you'll need to use a running stitch, which basically means you'll be making a line of stitches up and down through the fabric at even intervals. Ideally, these will be straight and regular stitches, about six stitches per inch. As you work, place one hand under the quilt sandwich to stabilize the surface. Take several stitches onto your needle, and then pull the needle through. Make sure the stitches are smooth and are not gathering the fabric. Then take more stitches. Keep going in this way until you run out of thread. Then knot the thread by sewing in one place a few times, thread the needle again, and continue. You can quilt in whatever design you want, including sewing in the seams of the quilt top (called "stitch in the ditch"), sewing a quarter inch from each seam, or using quilting stencils as patterns. When you are done quilting, lay out the quilt to make sure everything is smooth. You can then trim the quilt edges and sew on the binding. Basic Beginner's Quilt - These designs minimize the piecing required and focus on the quilting. Because they are quilting-focused, they are great for learning to quilt by hand. Quilted Placemat - If you want to learn to quilt on a smaller scale, try this pattern for a quilted placemat. Once you make a few of these, you'll be ready to try something larger. Quilted Baby Blanket - This adorable mouse applique baby blanket is the perfect scale for learning to quilt by hand. You can try out a quilting hoop and get the hang of the process before moving on to bed-sized quilts. 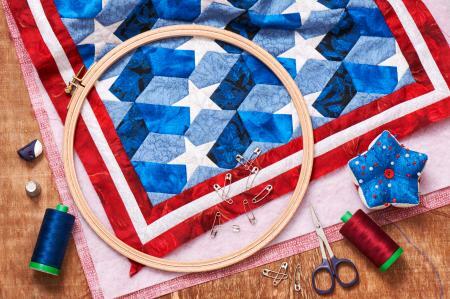 There's nothing quite like hand quilting for giving your finished quilt a quality, heirloom feel. The time spent stitching can be meditative and relaxing, and you'll end up with a gorgeous quilt you can pass down for generations to come.